Wonder | The Happy Wonderer ~ ellen b. Posted on December 17, 2018 by Ellen •	This entry was posted in Christmas, Heritage, History and tagged Christmas 1958, Tinsel. Bookmark the permalink. Good morning, what a special Christmas memory of you and your brother! Have fun at your open house! I’m making Judy’s prosciutto cheese pinwheels for my sister’s party. Oh yes! I see that Tim had quite an eye for that tree! 😁 I must drink lots of water and woe be unto me if I don’t. I feel about it as you do…not my favorite beverage. …oh how I remember tinsel. 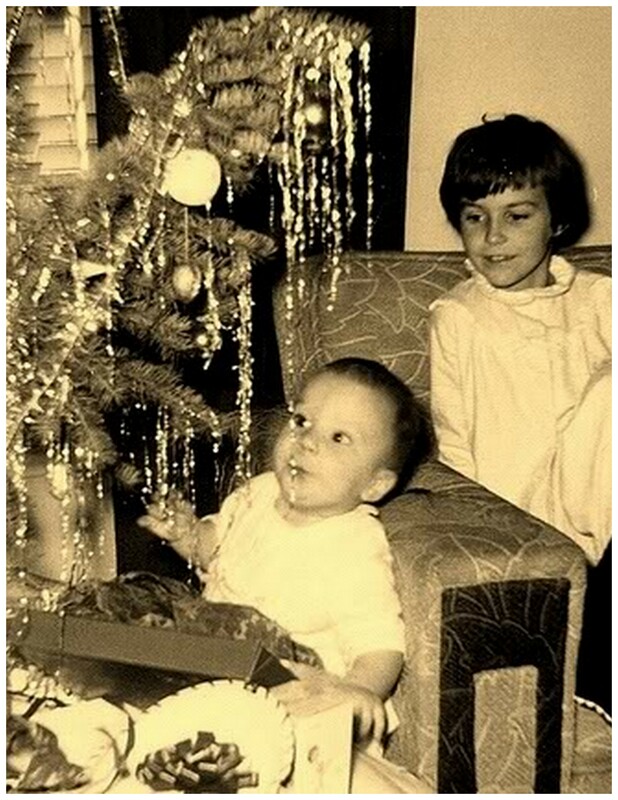 Sweet picture and memories of Christmas ago. Yes, I remember tinsel on our Christmas tree too. Have so much fun at your open house – such a great idea for your new home! Can’t wait to see what appies and drinks you decide on! Special memories cheer us up. That is such a cute photo and thank you for sharing your interesting memories. I had toxemia poisoning when I was around that age, and remember lots of trips to the hospital. Our poor mums, what they must have gone through. Enjoy your open house party. That will be a lot of fun. I still put tinsel on our Christmas tree. No tree this year though. Just a little fake one with lights that sits on a table. Tinsel! I haven’t seen that in ages. Thank you for your comment on my post of the Solzhenitsyn quote. Have you posted yet about when they went back in the 90’s? You mentioned it once! 🙂 I would love to hear. I wonder how your life would be now if they hadn’t escaped. I will be incorporating this part of their story in my Tuesdays with Moisi posts in the New Year. I can’t imagine what my life would be like if they never escaped…different would be an understatement. I can only imagine how it must have felt to have to endure what you did!!! I had the opposite thing going on as a child: an iodine deficiency. The doctor at that time suggested MORE salt with iodine. What?!??!?!!?! ?😳 I hardly think any physician in this day and time would go there!!! Salt for me was your water! Obviously your medical situation was much more dire, though. I’m sorry you had to go through that. I was born in ‘58, too. I don’t know that my sister was a thrilled as you to be usurped as not only the baby, but the only child after so many years! Ha, I guess I was bored with my older siblings! That is crazy about suggesting more salt with iodine. Merry Christmas to you, Alycia!